With the mind boggling range of fine custom gemstone jewelry that Kaisilver crafts each year, we often receive requests for feng shui gemstone jewelry. The Chinese concept of feng shui started many centuries ago. While the essence of feng shui does not necessarily relate to gems or jewelry - feng shui practice today seems to bring a flavor or crystal therapy and gemstone beliefs into the interpretation. While crystal theraphy related specific gems to particular mental or physical benefits, feng shui relates gems to particular directions. You might for example learn that, quartz is a primary gemstone for the West direction. An interesting thing about gems referred to in feng shui is that, the 'energy' or 'benefit' brought about the gem could be two fold. In some cases you would learn that, a specific gemstone placed in one direction, wards off negative energy. Similarly another gemstone placed in the same or some other direction, could actually attract more positive energy. While Kaisilver experts study gems and jewelry in all aspects which include, the metaphysical realm - we will never claim that any gemstone has any magical or medicinal property. Having said that we respect the thoughts and beliefs of all gem and jewelry buyers. So if you need a specific feng shui gemstone for a jewel let us know. Our tremendous reach and expertise in the amazing world of gemstones will almost always mean that we can satisfy your requirement. Before you rush your query to us, please keep reading this report. There is something that needs to be understood about, quality of a gemstone and price. For someone looking for specific gem purely because of belief and tradition - quality of the gem would take another meaning. For example, feng shui credits the gemstone ruby with special abilities. Ruby placed in the Norteast direction is supposed draw energies related to knowledge and wisdom - this is a well known feng shui belief about ruby. If you wished to get a ruby gem or a jewel with a ruby gemstone to help your feng shui practice, the quality of the ruby would imply that - the ruby would be natural and (probably) untreated. The other features of a ruby like, bright red color, high clarity and transparency and origin of the gem would not be relevant. Incidentally, most ancient jewelry related to tradition and customs implied silver and not gold jewelry. This is true of many religions and civilizations, gold was more a show of wealth, power and status while silver, delivered meaning and substance. What this means is that, the regular Kaisilver price which refers to medium to high gem quality material would need not apply to you. So you could probably go for a 2 carat cabachon cut natural ruby gemstone set in sterling silver and pay, no more than 400 U.S$ to 600 U.S$ for the jewel. You would need to realize that beauty would not be the top priority when we source or price the gem for your jewel. Our team will give emphasis to issues like, the gem being natural and (if possible) untreated. As in crystal theraphy and other gemstone related beliefs, you might request for the gem in your feng shui ring to touch the skin of your finger from inside. Many people believe that, the benefits of the gem gets amplified if the stone has even minimum contact with your skin. The Kaisilver support team would be glad to guide you on issues related to such jewels but, we might not be the best source for gaining indepth information related to feng shui teachings and concepts. It is quite obvious that, feng shui jewelry need not be limited to rings. You could wear a feng shui gem stone pendant, bracelet or even a pair of earrings. All these are jewels that we will readily craft for you once you have understood, the pricing and gem quality concept explained in the above paragraphs. Do not hesitate to contact our support team at sales@kaisilver.com for any information or clarifications that you might need. You will never be obliged to make a purchase from us so, it is a wise idea to take advantage of our expertise. Below are some examples of Kaisilver jewelry that have significance in feng shui and other crystal and gemstone related traditions. We can custom make these or any other jewel from our website, in gold or 925 silver with the gem stone of your choice. Do remember that we do not promise any special powers to any of the gems or jewelry that we provide. We would also suggest that you do not ignore the advice of a medical professional when, changing any medication or treating any illness that you might have. Jade is believed to encourage harmony in married life. Wearing a jade pendant or jade ring promotes peace and longevity. Many gem believers relate jade to love and virtue. In terms of feng shui, jade gives positive energies when placed in the Center, Southwest or Northeast directions. Feng shui attributes jade with the qualities like, harmony, love and wisdom. 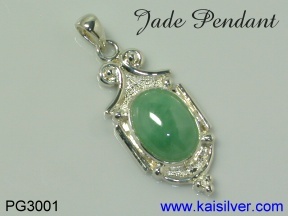 We have more on this gold or 925 silver jade pendant here. Most traditional gemstone beliefs related to garnets, presume the gem to be a red garnet. The historic claddagh ring shown above has a natural untreated, red garnet gemstone. The garnet is taken to symbolize faith, truth and devotion. Gemstone believers claim that garnet fosters confidence and thereby spurs success. Depending on the direction in which the garnet is place feng shui, relates the gem to spirituality, journey, partnership and travel. 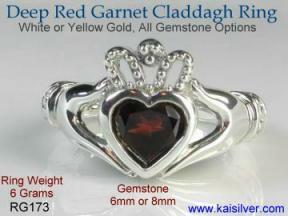 Read all about the interesting garnet claddagh ring here. Mined in the rugged mountains of Afghanistan, lapis lazuli has been sometimes wrongly referred to as 'sapphire' in ancient times. Gemstone believers say that this is a positive gem that promotes wisdom and opens the mind to ancient knowledge and happenings. Feng shui advices lapis lazuli in the Northeast, Center, North and West directions. The gem is attributed by feng shui to relate to, tranquility, knowledge, personal journey and creativity. 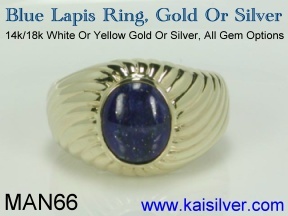 The complete report for this amazing mens lapis lazuli ring can be reviewed here. Emerald with a very long history and tradition figures prominently in gemstone beliefs and feng shui too. With this simple emerald ring we also demonstrate that, feng shui gem stone jewelry need not be lavish and extravagant. Emeralds symbolize love and attract good fortune. It has often been associated with rebirth as green creations of nature have life and growth. Feng shui recommends emerald for relationships, wealth and personal growth. Learn more about this elegant emerald ring here. Kaisilver can custom make all types of gold and silver jewelry. The designs for your custom made jewellery requirements can be yours or ours. With gem procurement capabilities extending to every mining location on the globe, we provide all gemstone options for both gold and sterling silver custom jewelry. The fact that we maintain complete control over the entire design and production process including gem procurement and custom cutting, reduces the need and expenses of multiple middlemen. What this means is that you get more gem and jewelry value for the money that you pay. You do not get saddled with fancy overheads and high sales staff commissions. Our support team can be contacted at sales@kaisilver.com with any questions or requirements that you might have. 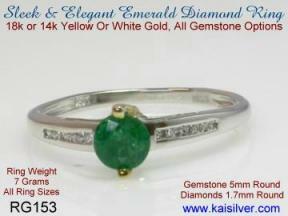 More Articles: Check out the complete list of gems and jewelry articles compiled by Kaisilver experts .... more. Do contact our support team at sales@kaisilver.com if you have any comments, suggestions doubts or queries. We will love to hear from you. Let us know if you would like to have a report related to a specific issue related to gemstones and jewelry. We are NOT interested in advertising offers so please do not email us with requests to place your ads on our newsletter or website.